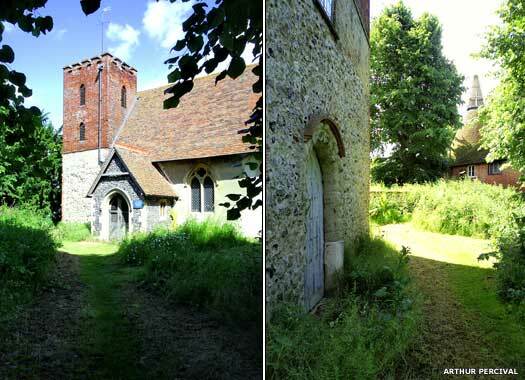 St Mary's, Luddenham is reached by tortuous narrow lanes from Faversham, and lies on a tiny spur of land overlooking marshlands reclaimed from tidal saltings, mainly in medieval times. There seems never to have been a village of Luddenham. 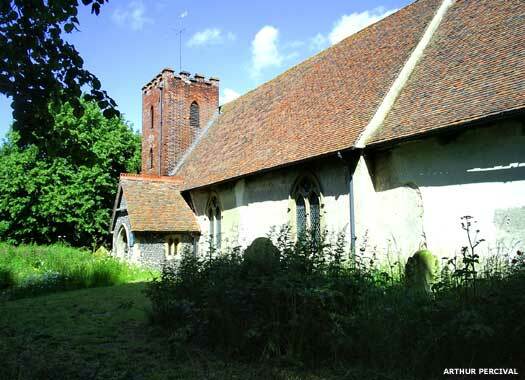 The church stands in a farmyard, a stone's throw from the manor house, Luddenham Court. The parish has fluctuated over time, increasing as saltings were reclaimed, decreasing when portions were given to other parishes. In December 1821, William Cobbett wrote of the marshes: "it is impossible to see a finer country than this. You frequently see a field of 50 acres, level as a die, clean as a garden..." The parish once had detached portions between Oare and Faversham Creeks; alongside Perry Court, south of Faversham; and furthest away, alongside the Thanet Way two miles east of the town. The churchyard is quite large, and interesting memorials survive, but a little overgrown in summer. The population of the parish has never been large, so it's perhaps surprising that the church is so big - no aisles, no chapels, but a nave and chancel nearly thirty metres (100 feet) long, and quite broad. A northern medieval tower was attached to the east end of the nave which collapsed in 1807 and was replaced by a small brick tower built within the footprint of the nave at its south-west end. If the church had a chancel arch, it was destroyed by the collapse of the tower. There are only two monuments inside the church, and the building was rather heavily restored in the 1870s and 1880s. It was declared redundant in 1972, and was stripped of most of its furnishings. 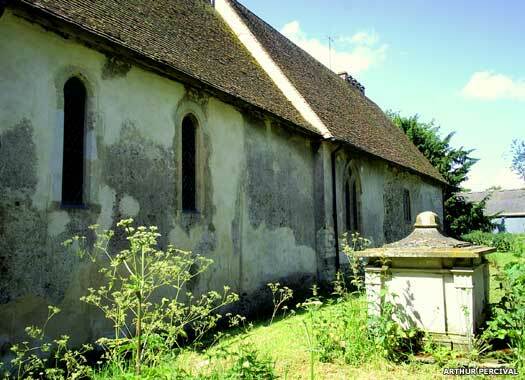 There were then plans to turn it into a private agricultural museum, but these proved abortive, and in 1992 it was vested in the Churches Conservation Trust. The Trust re-restored it, sensitively and sympathetically, and it is now in better shape than it has been for centuries. No electricity is laid on. Instead, lighting is by candles and oil pressure lamps. 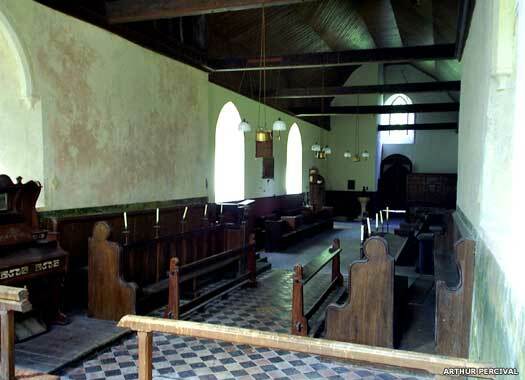 Towards the end of the 2000s some Victorian pews were reinstated, laid out longitudinally down the nave, college-chapel style. 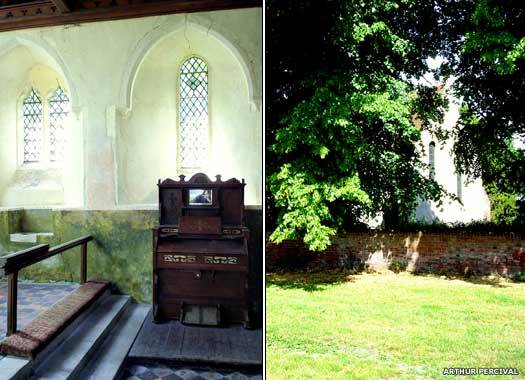 Since 1972 the church has been used only for funerals. However, ordinary services now take place very occasionally, and concerts may be held. 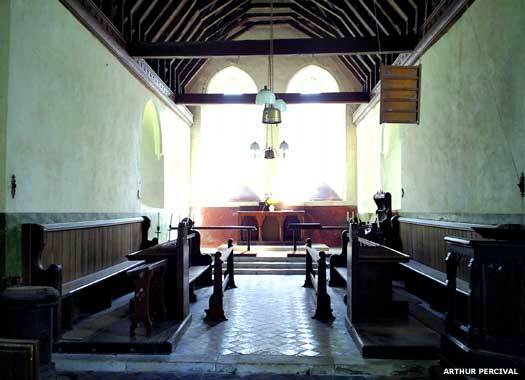 The building is open daily throughout the year, maintained by means of contributions to the Churches Conservation Trust. The structure is Norman, but the only distinctive features to survive are the west door (kept closed today) and the entrance from the Victorian south porch. The windows are Early English and Victorian, except for one from the fifteenth century. Roman bricks, salvaged from a nearby villa, supplied the quoins at the corners. 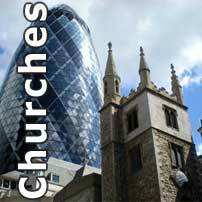 Their presence may suggest an Anglo-Saxon origin, but there is nothing else to indicate this - the walls are much thicker than in earlier churches. All photos and text on this page contributed by Arthur Percival.